The lights are out at the T Bar Saloon & Restaurant on Route 30 just south of the village of Roxbury. A sign appeared on the door earlier this week announcing the closure and thanking patrons, many of whom were loyal regulars. Owners Ray and Elaine Andryshak have operated the casual eatery, which took its name from a ski lift in a nod to nearby Plattekill Mountain, for a little more than a decade. The Andryshaks did not return a phone call seeking comment. The restaurant put on a special Octoberfest menu each fall and hosted many community fundraisers for a variety of good causes. The business and property, which is three and a half acres with a pond and outbuildings, have been for sale for several years. 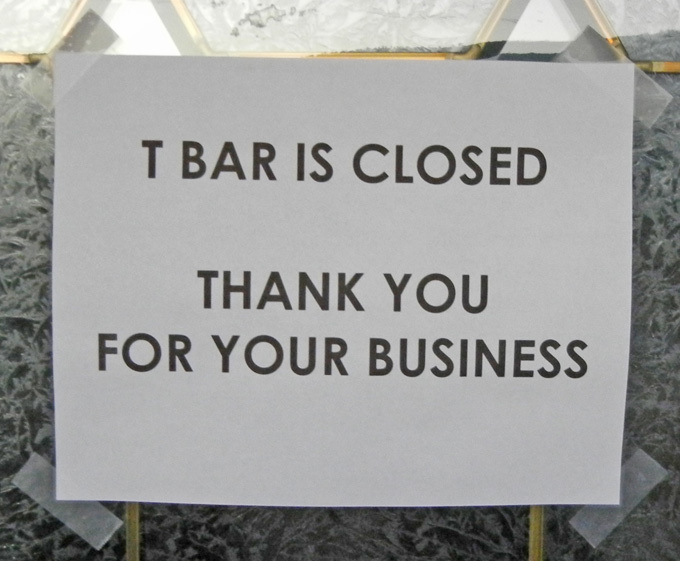 The T Bar was the second Roxbury restaurant to close up shop last month; Queens Mountain Cafe on Main Street closed July 17.